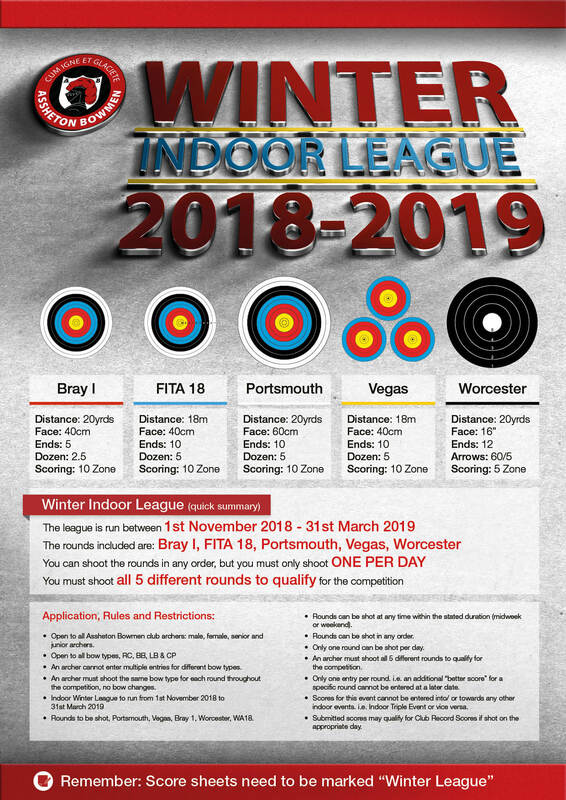 A competitive indoor archery winter alternative to shooting just Portsmouth rounds. To give archers experience at shooting additional indoor rounds/distances. To form a competitive club winter league. Open to all Assheton BM club archers, male, female, senior and junior archers. An archer cannot enter multiple entries for different bow types. An archer must shoot the same bow type for each round throughout the competition, no bow changes. Rounds to be shot, Portsmouth, Vegas, Bray 1, Worcester, WA18. Rounds can be shot at any time within the stated duration (midweek or weekend). Rounds can be shot in any order. Only one round can be shot per day. An archer must shoot all 5 different rounds to qualify for the competition. Only one entry per round. i.e. an additional “better score” for a specific round cannot be entered at a later date. Scores for this event cannot be entered into/ or towards any other indoor events. i.e. Indoor Triple Event or vice versa. Submitted scores may qualify for Club Record Scores if shot on the appropriate day. An archer shoots a round of each of the above indoor rounds. Score sheets to be marked “Winter League” and signed by both the shooter & the scorer. Score sheets to be pinned to the score sheet clip for recording and verification by the Club Records Officer. The scores for each of the 5 rounds are totalled and the archer with the highest overall score / bow type / class at the end of the tournament is the club Indoor Winter League winning archer for that section. Winners to be announced on the Club Presentation Day.